Wednesday, April 5th, was our meeting in Ann Arbor. We met at the Barnes & Noble Bookstore on the corner of Washtenaw and Huron Parkway (3235 Washtenaw). It was so-o-o nice to be back in a bookstore again, especially one that was so welcoming! The minute I walked in the first set of doors, there were various books vying for my attention. Once through the next door, the magazines and the café were to my right, the Information Desk in front, and stationary, cards, etc. to the left. This bookstore also has a second floor filled to overflowing with books in many different genres. Fiction, history, psychology and more are all on the second floor. There are also chairs throughout so you can sit and peruse the books you’re interested in. Everything was ready for us when we arrived for the pre-meeting. Once we took the escalator to the second floor and turned right twice, there was a long brown table waiting with chairs on both sides and a “Reserved” sign on top. We all felt so welcome! The pre-meeting went very well. Barbara led us in a writing activity about “Our Crazy Family”. And, we had new member, Michelle, join us for the evening. John led the main meeting. We had three pieces and there was plenty of time for feedback on each. 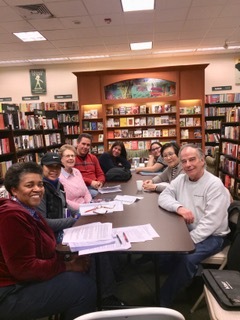 In fact, the discussions were so lively and extensive that we barely finished by 9:00 p.m.
Our next meeting here at the Barnes & Noble in Ann Arbor will be Wednesday, May 3. The weather should be better by then and all of us hope that more people will be able to make it! If you want driving advice, coming from Livonia on M-14, make a left onto #23 South. After the Geddes Exit, the traffic slows down that time of night. So, take the Geddes Exit on right and continue on Geddes to Huron Parkway. Turn left onto Huron Parkway. In a few minutes you’ll see a shopping center with a Walgreens Store on your right. Turn in and go past a few stores. You’re here! Barnes & Noble is on your right. If you come to the light on Washtenaw, turn right and then right again into the shopping center. Barnes & Noble will be straight ahead. Looking forward to seeing you on May 3! Claire, you described the Barnes and Noble experience beautifully. I know that I’ll spend more time and money there. Good post, Claire. The store sounds like a great meeting place. Hope to make it there later this year.